A beautiful dusk wedding at a historic hotel in Singapore was one of the highlights of Yogita and Rishi's nuptials in Singapore. 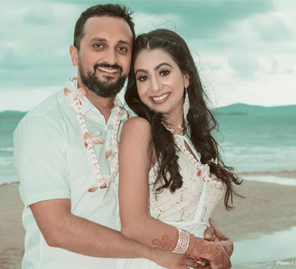 Yogita and Rishi got married in the buzzing city of Singapore and picked beautiful venues for their charming wedding that was planned and executed by Singapore-based WeddingSutra Favorite - Impressario Inc. Read more details below. The Impressario Inc. team helped the couple plan and execute their dream wedding. 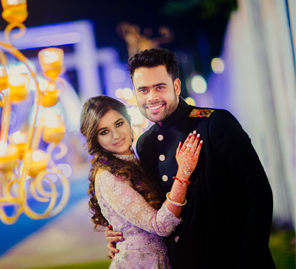 Yogita shares, “The entire Impressario team deserves a big 'Thank You' for doing a fantastic job coordinating our wedding. They worked tirelessly managing RSVPs, liaising with vendors, handling transport… the list goes on. I am so grateful to Satish, Sneha, Mithi, Azlin, Jatin, Ester, Johnny, and Ekta for all their hard work and dedication. It is clear that this team loves what they do, and they come highly recommended to any bride looking to have a blast at her wedding!" This was the beginning of a new chapter in Rishi & Yogita's story. An occasion as momentous as this requires the grandiosity that The Lantern at The Fullerton Bay Hotel provides. Overlooking the breathtaking Marina Bay Sands painted by the pinks and deep blues of the sunset sky, the couple stood beneath a beautifully crafted red wedding arch. 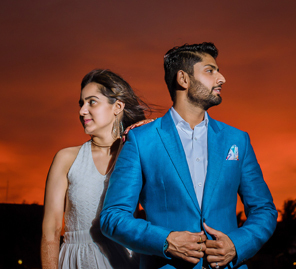 Vows and wedding rings were exchanged as dusk fell, marking not just a change in time but a change in the couple’s lives as well; Rishi and Yogita were now officially married. Yogita’s family home was transformed by Impressario Inc’s team into a traditional yet vibrant space for the customary prayers, and later for a mehndi party. Yellow, pink and orange hues lit up the interiors of the bride's home. The bridal seating with the flower arrangements against the windows was reminiscent of Indian summers. This was a day of royal splendor and opulence. The bride wore a gorgeous red lehenga and accessorized it with a stunning statement necklace and earrings while the groom wore a textured salmon sherwani and a matching turban. 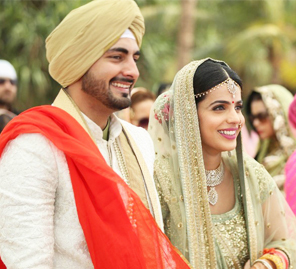 The wedding took place at the Gurudwara Sahib Katong where the young couple made a commitment to each other with the Guru as their spiritual witness. As the wedding ceremony ended, it was time to amp up the music and dance the night away at the reception which was held at the Shangri-La Hotel, Singapore. The Impressario Inc. team put together a fun and quirky backdrop of picture frames, illustrating the countless numbers of new memories that the couple will create in their exciting adventure as husband and wife together.